There is no limit to the number of businesses or individuals that can be nominated. Businesses and individuals are encouraged to nominate themselves. See below for awards categories and eligibility. Awardees will be honored at the 13th Annual Business Supports the Arts Breakfast Thursday, October 10th at the Amber Room Colonnade. The Business Supports the Arts Awards are designed to put a spotlight on small, medium, and large companies who support the arts in a big way! We also look to acknowledge individuals for their exceptional volunteerism for the arts. 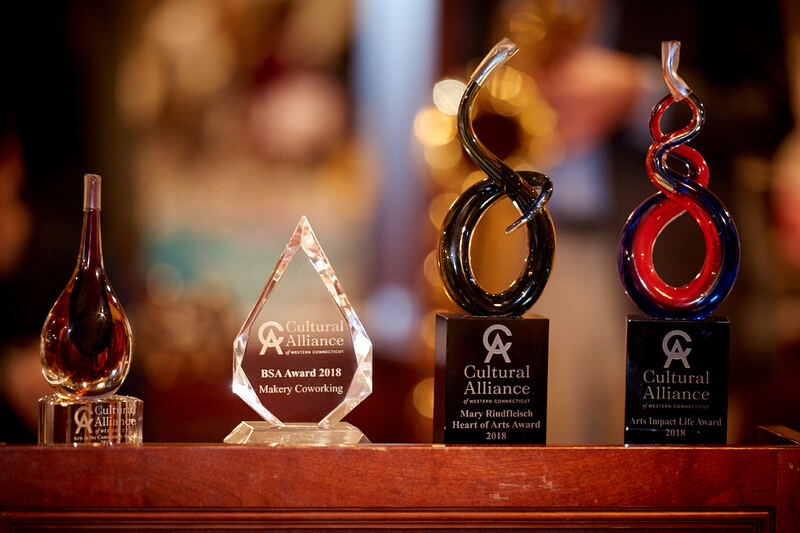 Organizations that present or produce arts are eligible for the "Arts Impact Life" Award only. BSA AWARD. Presented to a mid-sized or large business and the most prestigious award given for exemplary giving practices to the arts. Support to the arts have a broad impact to art and culture throughout the region. ARTS IN THE COMMUNITY AWARD. Presented to a local small business or entrepreneur who encourages and supports innovative ways to leverage the arts to build and sustain a vibrant, healthy, and creative community that fosters economic development. A business who supports to the arts in this category is impactful to the local community. HEART OF THE ARTS AWARD. Presented to an individual and recognizes their outstanding volunteer efforts and contribution made to nurture arts and culture and increase quality of life in their community. ARTS IMPACT LIFE AWARD. Presented to a nonprofit or for profit business who uses the arts to significantly impact the quality of life for their constituents and the people they serve or do business for. Please note: Nominators must notify their nominee(s) in advance and receive acknowledgment that if selected, their company will be present at the breakfast to receive the award. Nominators and Nominees agree to media coverage and use of information for publication by submission of the nomination form. BSA Awards - Large to Mid Sized Company Arts in the Community Award - Small Business/Entrepreneur Heart of Arts Award - Individual Volunteerism Arts Impact Life Award - arts organizations are eligible! Describe how does this business or individual support Art, History, Culture in the Greater Danbury area? Describe accomplishments/ impact to the community.